Last night, a new friend of mine noticed that I try to highlight the issue of Palestinian political prisoners in my writings. That led to a long chat about my interest in bringing out their stories. I started by describing how being the daughter of a former detainee has inspired a passion toward my homeland and the feeling of having a duty toward my people, especially our forgotten prisoners, within me. I told him how attending the weekly protest with prisoners’ families in the Red Cross has turned to be a psychological cure for my own pains. It’s true. Sometimes I feel very sad, but as soon as I see a prisoner’s mother, wife, or daughter smiling, my spirit strangely rises. Interacting with the prisoners’ families and listening to their stories, full of suffering and pride, has created a warm relationship between us. They have become an important part of my life, and a reason to live. I’ve always criticized the way prisoners are presented as numbers. Reports often show them as mere statistics, omitting that behind these figures there are humans desperate for dignified life and justice. Humanizing their issue by making their stories heard has been the main goal of my writings, with faith in humanity preserving my hope that their stories may wake the sleeping to take action. Unconsciously, my life has recently centered on Khader Adnan. He is an administrative detainee who has been on hunger strike since December 17 to protest his illegal detention without trial. I have followed updates about his continuing hunger strike, his silence, his deteriorating health, the ban on his family visiting him, and the Israeli Prison Service (IPS)’s indifference and neglect of his situation. Gaza has held many events in solidarity with him and his family, who are terrified that each new dawn could bring news of his death. 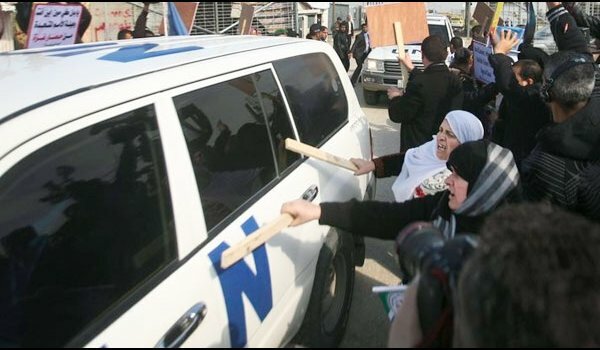 Families of prisoners and martyrs are protesting against Ban Ki_moon for his refusal to meet them. From Khader Adnan’s story, which has repeated itself thousands of times in Palestine, to news about United Nations Secretary-General Ban Ki-moon’s visit to Gaza, anger and frustration have dominated my mind. Representatives of families of Palestinian prisoners in Israeli jails and martyrs’ families wanted to join the delegation that would meet Ban. Civil society figures made intensive efforts to ensure that this would happen so he could hear about their demands and long years of suffering. However, Ban simply refused to meet these people, who wanted his support and protection for their violated rights. An angry crowd, having heard of his repeated visits to former Israeli prisoner Gilaad Shalit, hurled shoes and stones at his convoy as it entered Gaza Thursday morning. I watched the video of the prisoners’ families throwing shoes and stones. Honestly, it filled me with joy and pride in my people. I thought that it might make the Palestinian people look bad in front of the international community. But I would have only one response for those who might define Palestinians as mere throwers of shoes against diplomats: Those shoe throwers included angry relatives of prisoners who have endured terrible conditions at the hands of merciless Israeli jailers. 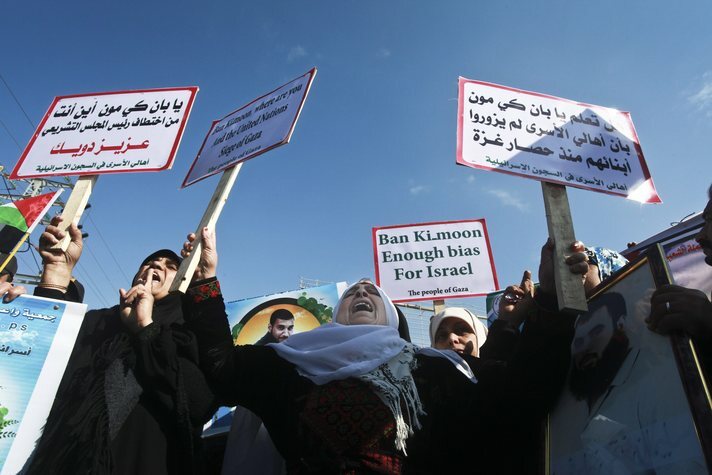 They are frustrated with Ban’s biases toward Israel, and have witnessed more than enough of Israeli brutality, tyranny, and violations of their simplest rights guaranteed by international law and the Geneva Conventions. Those people have been filled with anger by more than five years of living under a closure imposed by Israel, and declared illegal by UN bodies. They haven’t been allowed to visit their relatives in prison since Hamas was democratically elected, boycotted by the UN, and marginalized as a terrorist organization. mother of a political prisoner who has spent 26 years in Israeli prisons, and for 26 years, she has never stopped calling for the freedom of her son. Despite her age, she has joined every hunger strike prisoners launched since her son was detained, and has never missed a protest for Palestinian political prisoners. She always says, “I am not only the mother of the detainee Ibrahim Baroud, but of all the prisoners and oppressed. I’ll keep calling for their freedom as long as I am alive”. Last Monday at the weekly protest in the Red Cross, she limped because of a pain in her leg, but was still fasting in solidarity with Khader Adnan and all prisoners. She spoke for the prisoners to the media, appealing to every human right organization to witness the suffering of Palestinian detainees and act. In the video, she was angry as never before, gathering all her physical power to hit Ban’s convoy with a stick. Her strength has always impressed everyone who knows her. “I know I am for Ban, nothing more than a mother of a ‘terrorist’”, she told me on the phone with rage. “Why would he bother to listen to me? He must know that I am the mother of a human being who deserves dignity even in detention. And I am a human who deserves to be heard”. No one should blame this mother, who has been deprived of wrapping her arms around her son for 26 years. No one should blame her after she witnessed countless Israeli attacks on Gaza, especially the 2008-2009 war. She saw the phosphorous bombs, banned by international law, falling on civilians who took shelter in the Al-Fakhoura UNRWA School after fleeing their homes. She lives near it. Don’t blame her when she explodes with anger after hearing of Ban Ki-moon’s thanks to Israeli Defense Minister Ehud Barak – the architect of the 2008-2009 war – for his “generosity” towards Gaza; his generosity in redeeming the world of 352 children whom, if they hadn’t been killed, would have grown up into terrorists to threaten the holy security of Israel. Don’t blame her or any Palestinian when UN did nothing against Israel for the war crimes Israel committed even at UNRWA sites. Instead, they are biased toward Israel, while we have been terrorized daily by the Israeli Occupation ever since it was illegally established through ethnic cleansing. After this “disrespectful welcome” of Ban Ki-moon by the angry families of prisoners and martyrs, the Palestine Liberation Organization (PLO) shamefully sent apologies to him. But I’ll allow myself to speak on behalf of Palestinians and say proudly: “We make no apologies!” And I add: “The PLO doesn’t represent us.” Palestinians aren’t the ones who should apologize. The one who should apologize is who keeps talking of human rights, yet sees human rights continuingly and openly violated by Israel, but does nothing, instead covering up Israel’s crimes against humanity. Actually, thousands of apologies wouldn’t suffice to heal the long, bleeding wounds that Palestinians suffer from the long course of Israel’s occupation and existence. This entry was posted on February 4, 2012 by Shahd Abusalama. It was filed under Palestinian Political Prisoners and was tagged with Ban Ki-moon, Cast Lead, Gaza, Gaza siege, Gaza War 2008-2009, International Law, Israeli Occupation, Israeli Occupation Forces, Om Ibrahim Baroud, Palestinian Political Prisoners, Palestinian prisoners, UN, United Nations. SubhanAllah.. here I am in the US, comfortable in my jamas and home, reading these blogs and hearing freedom songs about Palestine(Umadeekum) and martyrs such as Vittorio….then I hear about Om Ibrahim and her son.. I have a son who is 22.. I cant imagine not hugging him for 22+ years..SubhanAllah.. because he is in prison, ?? Breaks my heart.. I send my salams to Sister OmIbrahim and she is in my duas..My husband is Palestinian and so I have embraced Palestine and the people.. Wish I was there to understand what the people go thru.. Alhamdullah for everything.. Thanks for this kind comment. I hope you’ll never suffer any of what we suffer here. You shouldn’t miss a day without hugging your son because he thousands of mothers are wishful to enjoy their sons’ hugs. Greetings to your husband and to the Muslim community in US and to all the Americans in solidarity with Palestine. My writings is to let you know that there are REAL people here in Palestine, humans just like you, who are being terrorized and humiliated every day at the hand of Israel. Spread the message and act for the sake of humanity. After reading this post, my suspicions have been proven: Ban Ki Moon is a “lame duck” UN Secretary General. He represents an institution that purportedly promotes human rights and yet he fails to see what is happening to the Palestinians. The Palestinians do not even need to owe an apology to someone who kowtows to the Zionist regime who flagrantly violates ALL principles of international law. Instead, it should be Ban Ki Moon and the UN that should apologise to the Palestinians for their lack of concern to their plight. I agree with you and with what you write, especially about Ban Ki-moon bad behavior and the shameful apologies PLO gave to him (that’s why I shared your post on my wall), but I have some doubt on what you define Palestinian sufference “from the long course of Israel’s occupation and existence”. What do you mean with the term “existence”? Do you mean that Israel should not exist? Or that Palestinian sufference started with the existence of Israel? I’m sorry but it’s not clear to me if you deny the rioght of Israel to exist or if you just claim the right of Palestinians to live in peace one the Occupied Territories (there’s a big difference between them). I meant how Israel existed on the ethnic cleansing of Palestine. I recommend you to read “The Ethnic Cleansing of Palestine” for the Israeli Historian Ilan Pappe. He’s actually one of my role models. Great human being. I am a refugee. My grandparents were ethnically cleansed from their original homeland Beit Jerja which is now the so-called Israel. And since their occupation of our land, we never had a peaceful day without murdering or arresting innocents or violating out rights. Do you expect me to say that Israel should exist? I call for BDS and for one-state solution. I’m sorry for the misunderstanding, I didn’t want to offend you and indeed I didn’t expect you to say anything, I just wanted to understand your opinion. Of course I cannot understand how you are living and what Israel’s existence means for you as a Palestinian. That’s why I ask quastions. I’m just trying to understand the situation by reading your blog, Ialn Pappé and other historians’ work (both Palestinian and Israeli) and asking quastions to everyone I know lived in Palestine or studied about it. I agree with you on this part of your answer “And since their occupation of our land, we never had a peaceful day without murdering or arresting innocents or violating out rights”. But still there’s something not clear to me: What you mean with one-state solution? One state for two people (the same kind of State Ilan Pappé is calling for) or one State just for Palestinians? Sorry for all these quastions, but I’m just sick of reading news from western media or studing from accademic papers. I would like to know what Palestinian people really think about the situation and your blog seems to be a good occasion to do it.